Only two weeks ago the mallard flock at Duck Hollow was large and busy with males and females feeding in pairs. Back then the flock was usually 20+ birds but now it’s half that size and mostly male. The females are missing. They’re on the nest. Female mallards (Anas platyrhynchos) nest on the ground laying one egg per day until the clutch is complete, about 10 eggs. Though she doesn’t build the nest the mother mallard pulls nearby vegetation toward her body to line the nest bowl. When she begins incubation she plucks down from her breast to surround the eggs and cover them while she’s gone. The eggs hatch in 28 days. Only the females incubate eggs while the males watch from afar. Except for a recess in early morning and late afternoon, female mallards are hidden all day — if they’ve chosen a good nest site. In urban settings the ladies choose some creative places, as in the video above and this photo under a stairway in Madison, Wisconsin. Three days before they hatch the mallard chicks call back and forth with their mother from inside the eggs. On hatch day all of them emerge within 6-10 hours. Next morning their mother leads them to water for their first swim. See all of this in Ian Oland’s video, above. So don’t be surprised when you don’t see female mallards at Duck Hollow in early April. 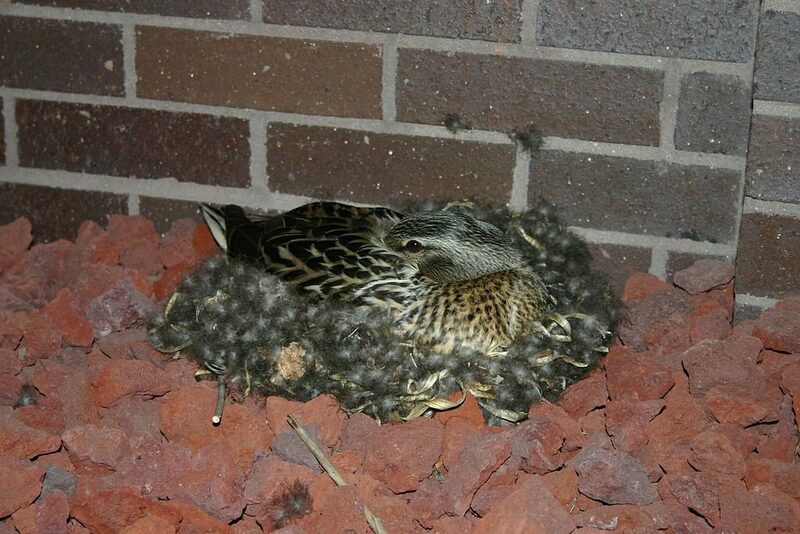 Right now the mother mallards are on the nest. 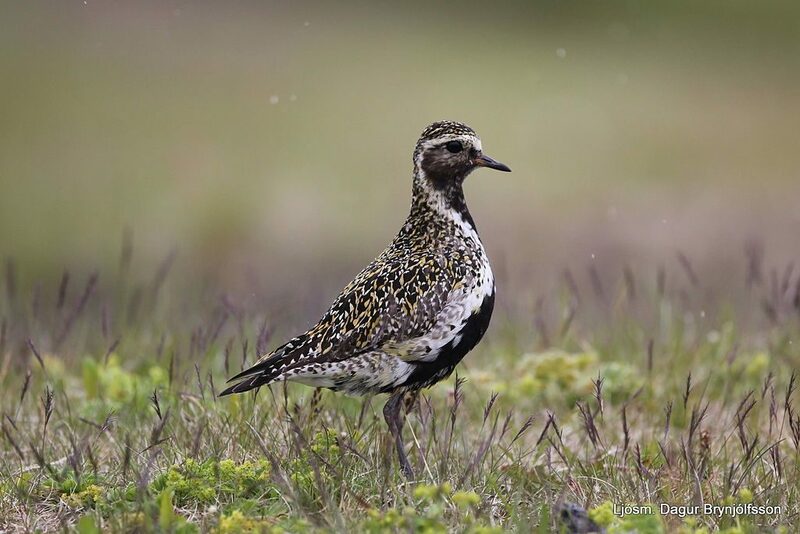 The world’s three species of golden plovers — European (Pluvialis apricaria), American (P. dominica) and Pacific (P. fulva) — are so stunning in golden breeding plumage that they stand out when we look at them. How do these ground-nesting birds avoid predation when they look so obvious? 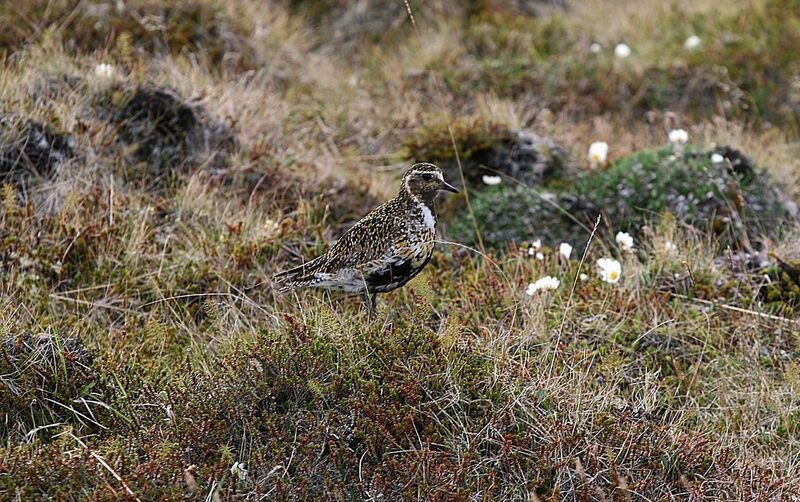 Above, a European golden plover is easy to see from the side, but blends into the background in the photo below, matching the tundra. 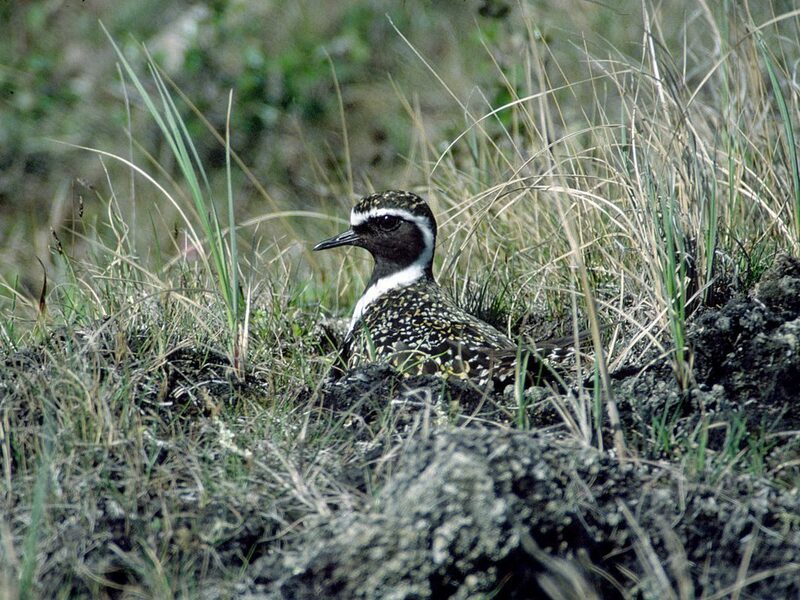 And their chicks are perfectly camouflaged to match the tundra habitat. Can you find the chick in the photo below? Who still thinks that these are couple of weeds? Anyway, this is a golden plover hatchling born with the power of camouflage fully activated. Who knew that gold can look like moss? In late March more than 440 lesser black-backed gulls congregated in a damp field in northeastern Pennsylvania — an exciting find because they used to be very rare in North America. Why are they here and where are they going? The Pennsylvania Game Commission is using satellite telemetry to find out. 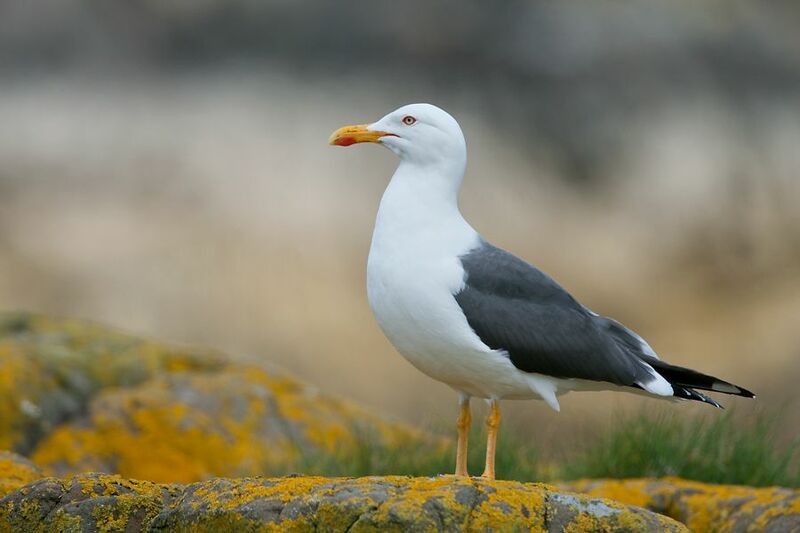 Lesser black-backed gulls (Larus fuscus) are an Old World species that breeds in Iceland, northern Europe, Russia and Kazakhstan and spends the winter in Europe, Africa and coastal Asia. They were never seen in North America until one showed up in New Jersey in 1934. Slowly their wintertime numbers increased until they’re now considered non-regular winter visitors to North America’s Atlantic and Gulf Coasts. See the map below. They still don’t breed in North America in numbers that count on that map. However, they might be thinking about it. 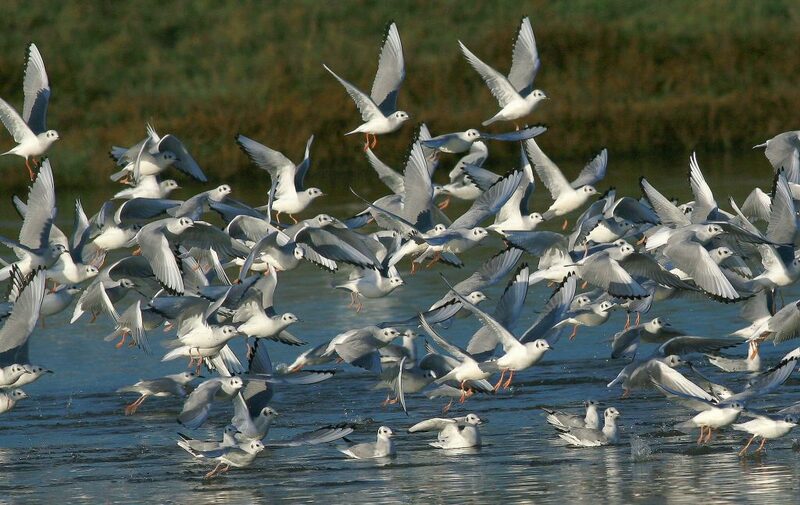 Meanwhile their migration numbers through Pennsylvania are high enough that ornithologists began to wonder if lesser black-backed gulls are bothering to cross the Atlantic to breed. Are they going to Iceland? We would know that answer if we knew where the Pennsylvania flock was going. Last spring the PA Game Commission attached satellite transmitters to nine adult gulls when they stopped over in Pennsylvania. The map of the gulls’ movements tells an interesting tale. 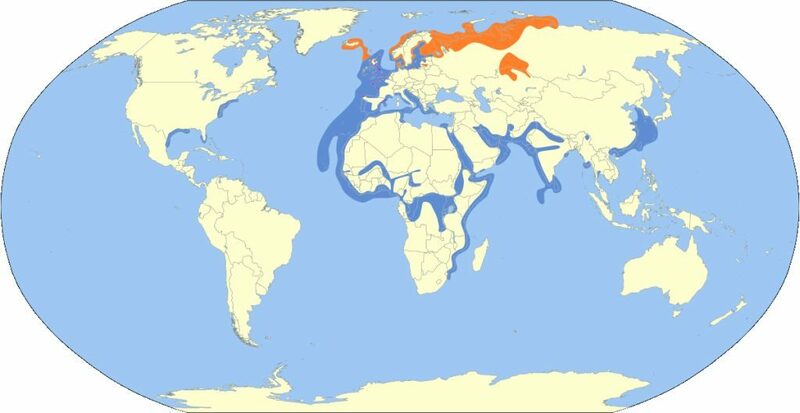 The satellite-tagged gulls don’t go to Europe. They stay in North America. Based on their sedentary lifestyle in June they seem to be breeding in Greenland and northeastern Canada. Is there a breeding population of lesser black-backed gulls in North America now? This year we’ll watch again to find out where they’re going. When Will The Bonnies Arrive? Some years spring migration is early. Some years it’s late. March is the time for ducks, blackbirds, phoebes, and gulls. I’m waiting for Bonaparte’s gulls (Chroicocephalus philadelphia) to arrive. Bonaparte’s gulls pass through Pittsburgh from late March through April. Seven years ago I wrote about their sudden appearance on 21 March 2012 on the Ohio River and at North Park. Read about their arrival — and their unusual nest location — in this vintage article: Bonnies On The Move. 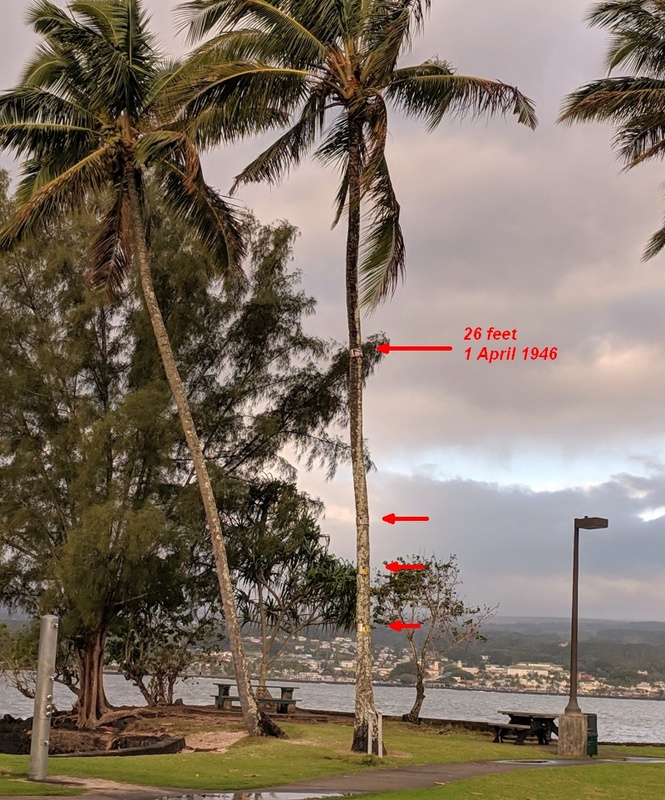 In Hilo, Hawaii there’s a palm tree in the city’s bayside park with metal rings on its trunk. Each ring is marked with a year and the height in feet. The highest one (arrow on my photo above) says “26 feet, 1946.” It memorializes a tsunami that spawned the Pacific Tsunami Warning System. Tsunamis, sometimes called tidal waves, are seismic sea waves caused by earthquakes, underwater landslides or explosions. They happen when the ocean is abruptly displaced, as shown in this tsunami animation. In the wee hours of 1 April 1946 a massive underwater earthquake struck offshore in the Aleutians near Unimak Island, Alaska. It was so massive that it created a 114-foot wave that swept away Unimak’s new lighthouse. The rest of it raced across the Pacific Ocean at 500 miles per hour and hit Hilo five hours later around 7am. The palm tree was there when it happened. The 26-foot marker shows the debris line left by the 1946 tsunami plus three other large tsunamis that passed the tree: 15 feet in 1960, 12 feet in 1952 and 8 feet in 1957. This video from September 2018 explains the markers (starting at the 1:19 timemark with the narrator’s face). The following video shows After and Before photos taken in 2010 and taken at the moment the tsunami hit the trees. Ultimately, the disaster had a positive outcome. 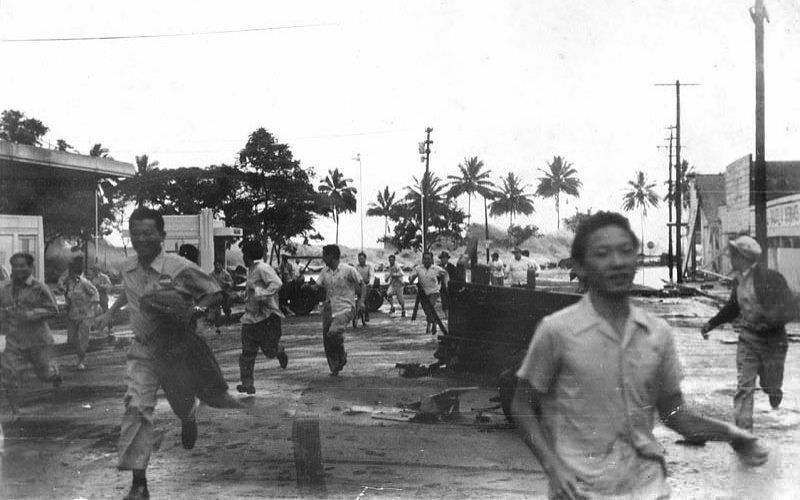 By 1949 the U.S. had installed a warning system, now called the Pacific Tsunami Warning Center, to detect earthquakes and warn of potential tsunamis. Throughout Hawaii you’ll see signs and sirens to tell you where to evacuate and when to leave. It was a terrifying 26-foot wall of water but it led to a safer future. If you want to see a Laysan albatross (Phoebastria immutabilis) Hawaii is the place to be. 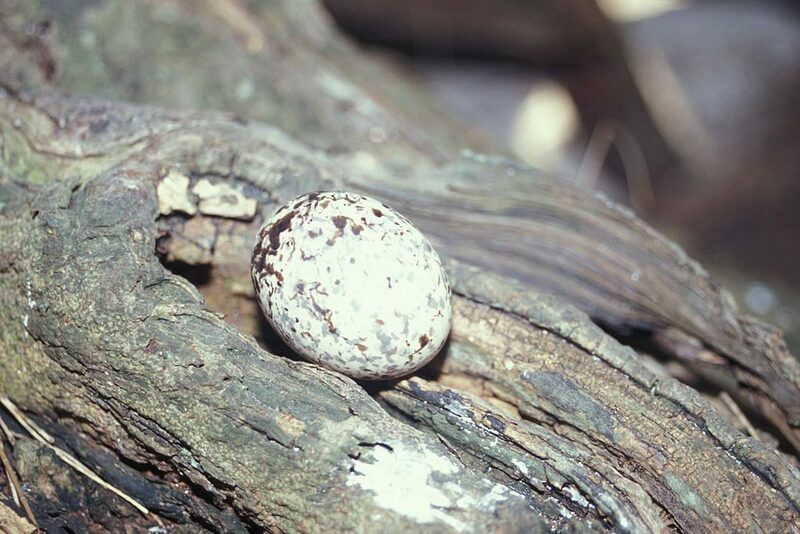 99.7% of the species nests on the Hawaiian island chain. Midway Atoll holds the largest albatross colony on earth. Most of the world’s 22 albatross species live on the southern oceans but the Laysan albatross is one of three that occurs exclusively in the northern hemisphere. Compared to most, the Laysan is relatively small. The wandering albatross has a wingspan of nearly 10 feet. The Laysan’s wingspan is 6.4 to 6.6 feet, about the size of a bald eagle. Albatrosses spend their lives roaming the open ocean feeding on squid and fish near the surface of the waves. They are built to soar, but they don’t fly high. 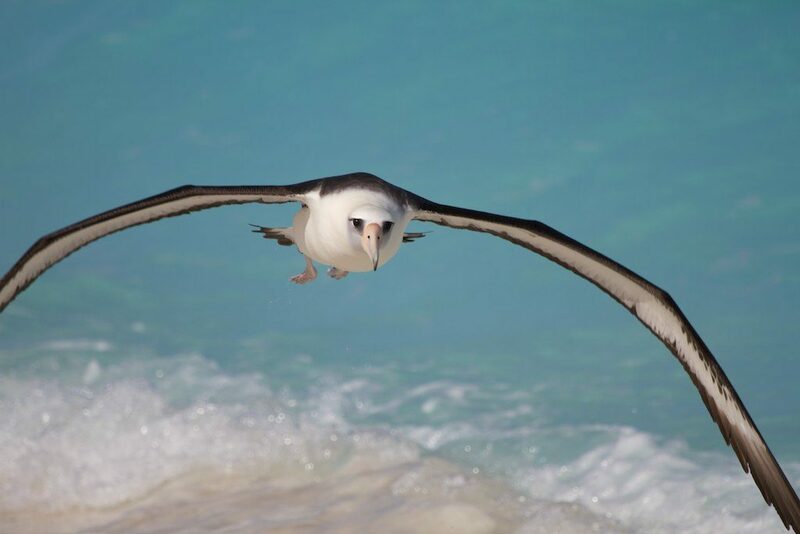 Their long wingspan allows them to soar dynamically near the ocean surface with a minimum of effort. In this way they fly 10,000 miles a year. Albatrosses only visit land to nest. 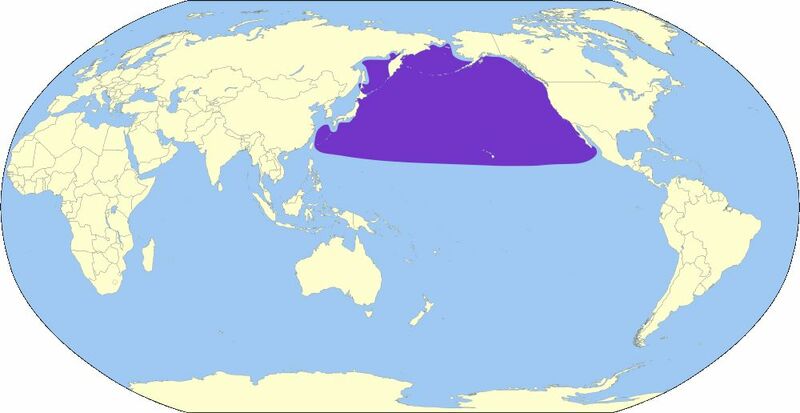 When not nesting, the Laysan albatross covers the range shown below, leaving Hawaii for Mexico, California, Alaska, Kamchatka, Japan, and the Phillipines. 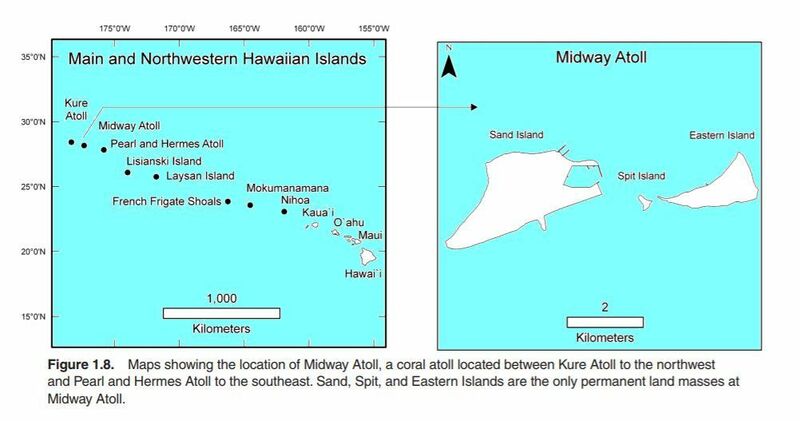 Named in 1893 for Laysan Island, where the species was first collected, their favorite nesting site is at Midway Atoll, a group of three islands near the northwestern edge of the island chain. Midway is home to nearly a million Laysan albatrosses including the oldest wild bird on earth, a female named Wisdom. Wisdom was banded as an adult at Midway in 1956. Since her species cannot breed until it’s five years old and usually delays breeding until age seven or eight, Wisdom is at least 68 years old now, possibly older than 70. Though not on a webcam this year, her fame spread in the past when her nest was visible online. 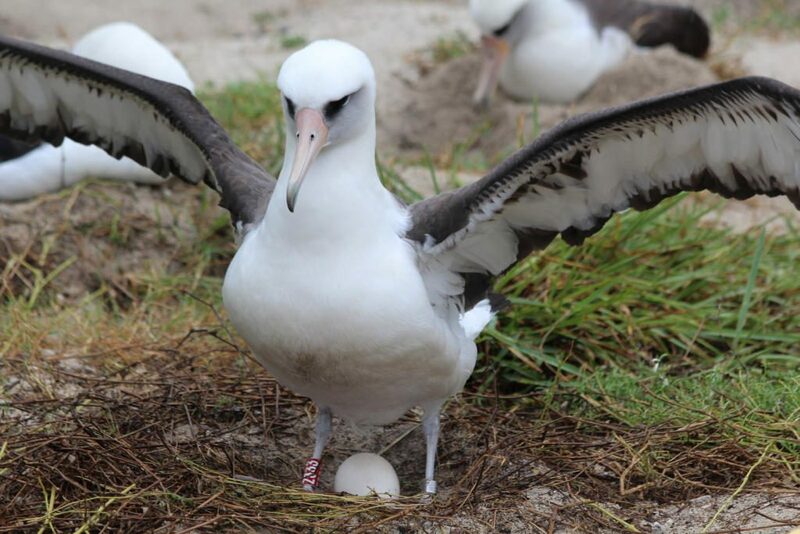 Most Laysan albatrosses breed every other year but Wisdom returns to Midway annually to court with her mate Akeakamai, lay her single egg, and take turns incubating the egg and raising their chick. This season she laid her egg around 29 November 2018. Akeakamai was on duty when the chick hatched on 3 Feb 2019. It takes two adults eight months to raise a Laysan albatross chick. They mate for life but when there’s a shortage of males two females will team up to raise one chick per year. Read about this unusual solution at: Ladies Make Do in a Pinch. Laysan albatrosses typically live 40 years but their delayed breeding age and single chick in 1-2 years means it takes at least 10 years for a Laysan albatross pair to replace themselves. This slow reproduction rate makes them vulnerable to catastrophe. 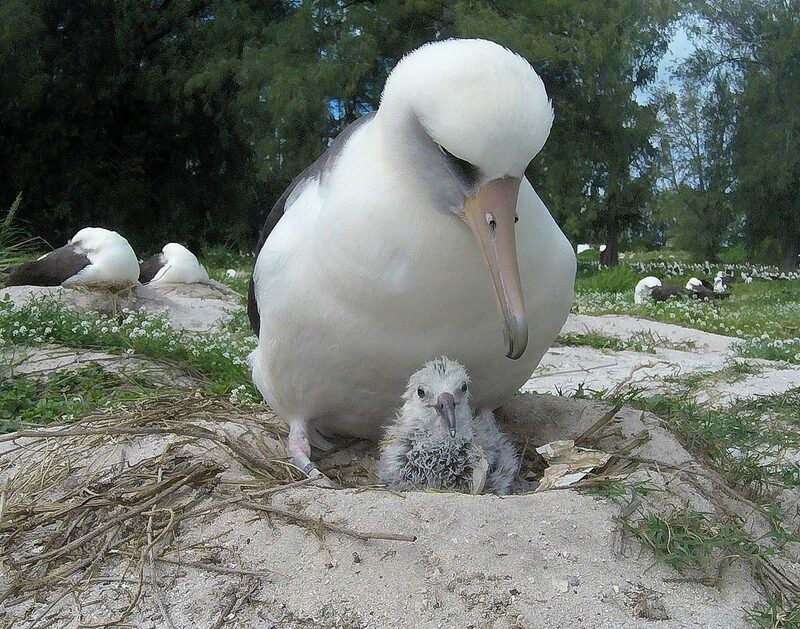 Not only are the birds threatened by longline fishing hooks and floating plastic on the ocean, but with 99.7% of the world’s population nesting on the Hawaiian islands they’re vulnerable if a disaster befalls their homeland. Tsunamis can devastate a single year’s colony, as one did in March 2011, but climate change will be the worst. Climate-induced sea level rise will submerge much of the largest albatross colony on earth. Our tour won’t be visiting Midway but we’ll see Laysan albatrosses today at Kileauea Point on the island of Kauai. Completely white with large black eyes, white terns have fascinated me since I first learned of their existence in 2010. At the time I never thought I’d see one but today I’m in Hawaii where they’re the official bird of Honolulu. They nest in Kapiolani Park near our hotel. White terns (Gygis alba) are immaculate white seabirds with long blue-black beaks and a buoyant erratic flight. 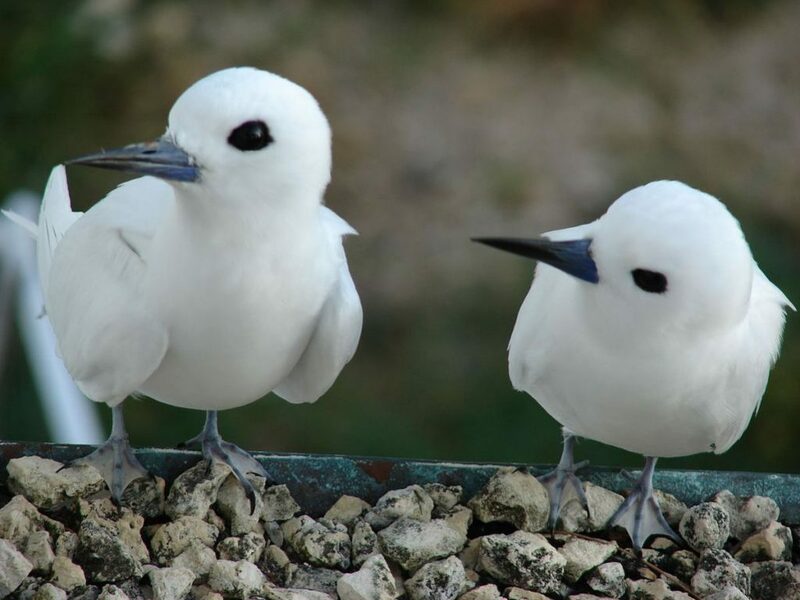 They live in the tropical Pacific, Indian and south Atlantic Oceans where their wide range and physical characteristics give them many names including common fairy terns, angel terns and manu-o-Ku in Hawaii. Surprisingly, Gygis alba are more closely related to noddies than to terns so they’re technically white noddies. White terns first caught my attention when I learned about their nesting strategy. They’re at the extreme end of Birds That Don’t Build Nests. The female lays her single egg on a thin bare tree branch without any nesting material. She tries to place it in a fork or natural depression but the egg is always in danger of blowing away. If it does, she quickly cycles and lays another one. 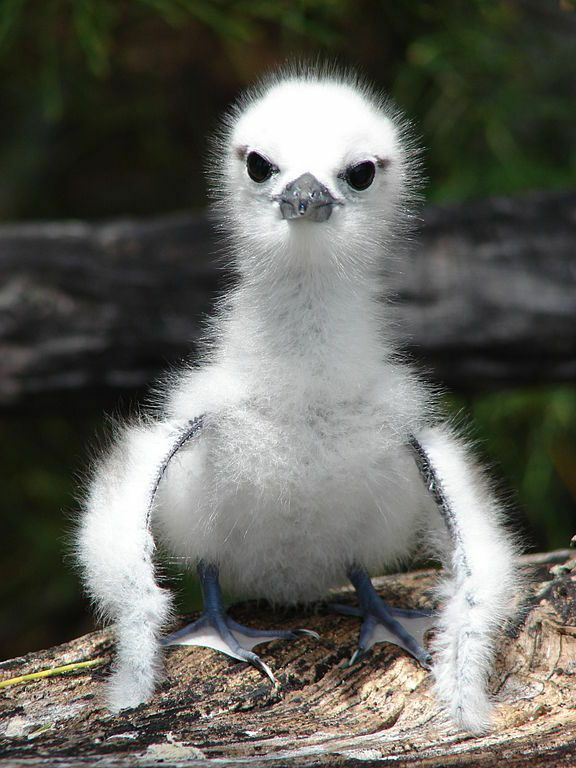 If it hatches, the chick is equipped with long claws and strong webbed feet to hang on in the wind. 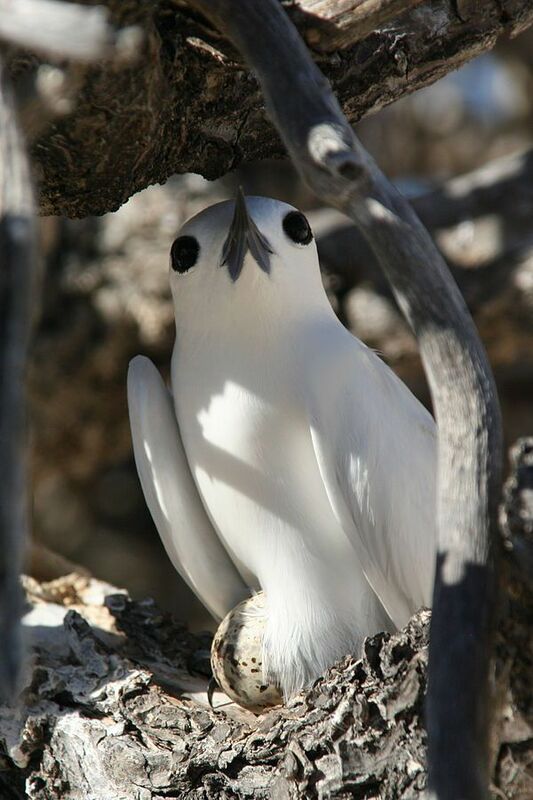 In this way white terns can raise up to three chicks per year. 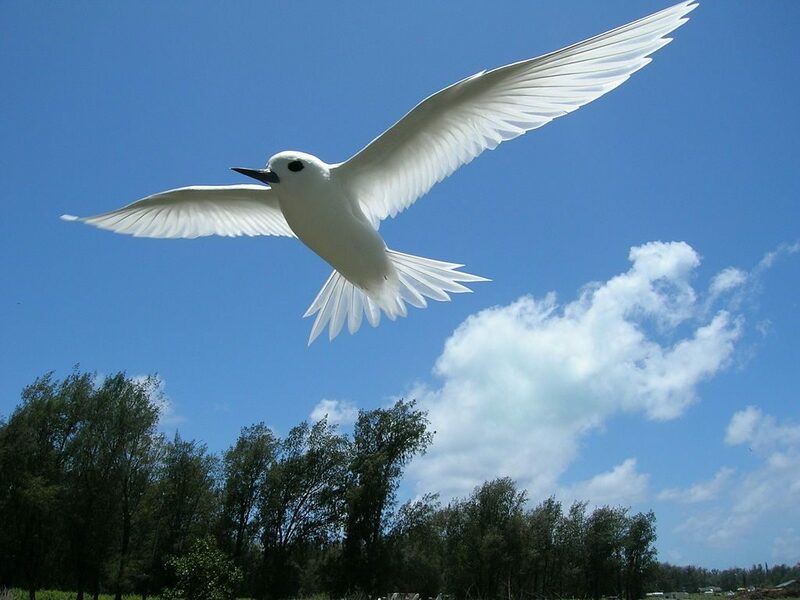 Today our tour will spend time in Kapiolani Park so I’m sure to see white terns. For the first time in my life I’ll see fairies. 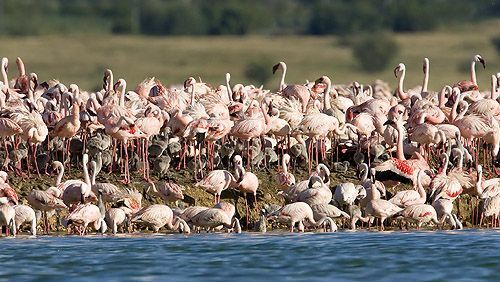 When severe drought, high temperatures and failing infrastructure hit Kamfers Dam in Kimberley, South Africa, the lesser flamingo colony that nests there was forced to make a dreadful choice. The lake usually provides food and their island provides shelter but the water was gone. Incubating adults were dying of dehydration. If the colony stayed, all would die so they abandoned this year’s breeding attempt — eggs and chicks — to live and breed again. Kamfers Dam is a privately owned dam just north of Kimberley, about halfway between Johannesburg and Cape Town, South Africa. The site was originally an ephemeral wetland but became a permanent lake thanks to runoff and treated wastewater from the town of Kimberley. 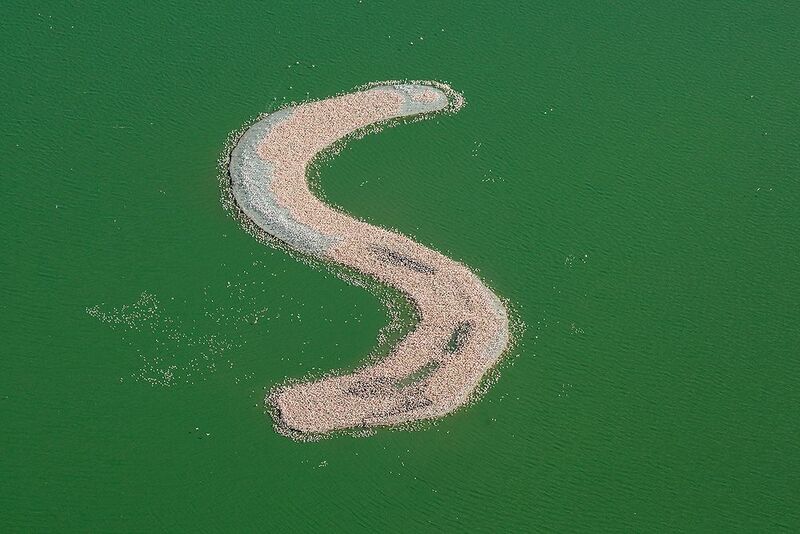 In 2006 people noticed that the lake attracted a Near Threatened species, lesser flamingos (Phoeniconaias minor), so they built an S-shaped breeding island for them (pin on map above). At the height of the breeding season it’s covered in tens of thousands of flamingos. Kamfers Dam is one of only six lesser flamingo breeding sites in the world and an international birding hotspot … until this year. In January, because of severe drought and high evaporation, a large part of the lake went dry. The lake level could not be restored by the water treatment plant because of their own failing infrastructure. The flamingos abandoned their desiccated colony, so people went out to rescue the chicks. Click here or on the screenshot below to see a video of the rescue posted by Saan Staan Kimberley on Facebook. 2,000 flamingo chicks and eggs, some in the process of hatching, were rescued by volunteers and taken to shelters around South Africa. 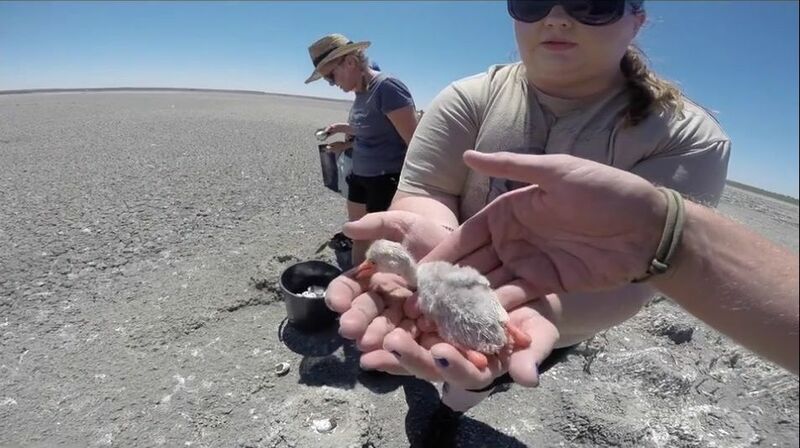 Then the hard work began — three to four months of feeding and monitoring thousands of flamingo chicks, many of whom arrived in bad shape from dehydration and starvation. Added to that is the challenge of not allowing them to imprint on their human rescuers. South Africans made a worldwide plea for volunteers. The National Aviary stepped up to help. 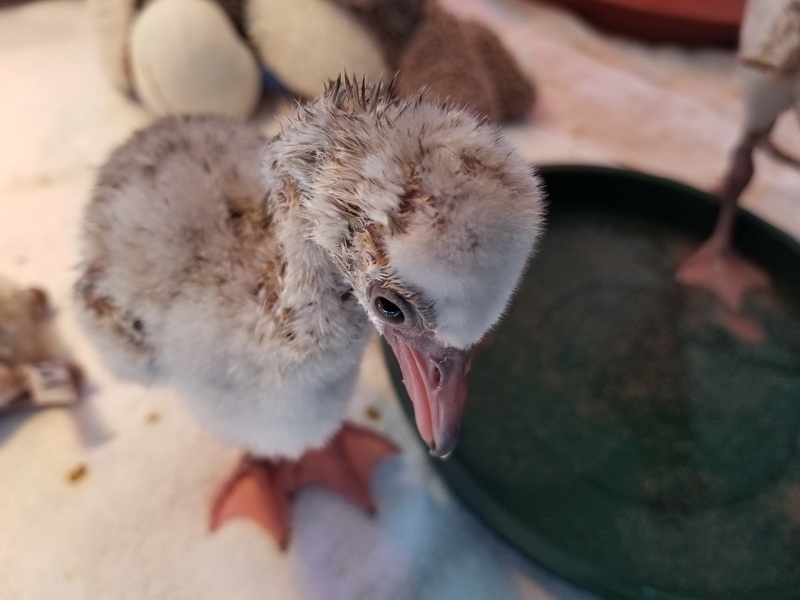 Terry Grendzinski, Supervisor of Animal Collections and avian specialist, knows all about raising baby flamingos so she flew to the SANCCOB rescue center in Cape Town. 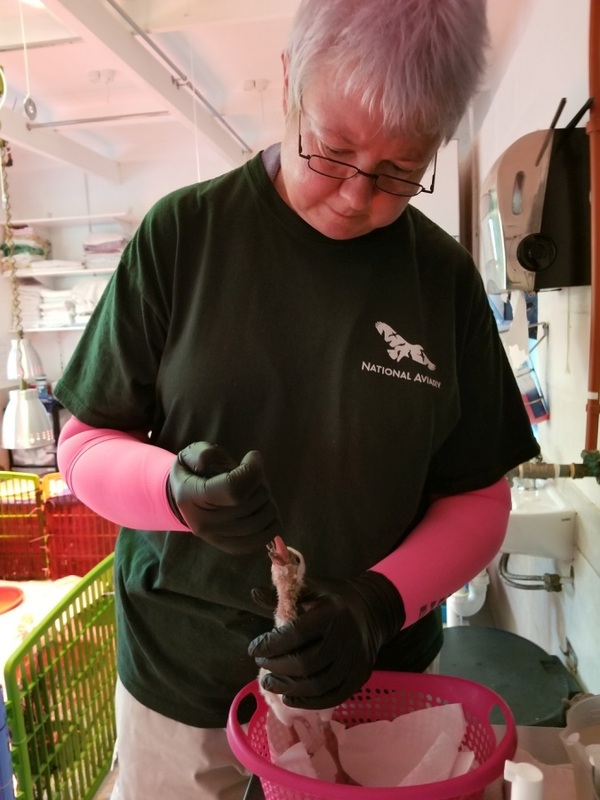 In the photo below she feeds one of the rescued chicks while wearing pink sleeves and back gloves to mimic the appearance of the chick’s parents. Click here to watch a video of the feeding. So far, so good. The chicks are growing, preening and sunning in their enclosure (video below). Some are already standing on one leg! Thanks to this massive rescue effort, this year’s lesser flamingo breeding season at Kamfers Dam will have a silver lining. You can donate here at the National Aviary to help these baby flamingos. In 2011 crane watchers in Homer, Alaska noticed that a single Canada goose was convinced he was a sandhill crane. How did this happen? And can it be undone? As described by Encyclopedia Britannica, imprinting is a form of learning in which a very young animal fixes its attention on the first object it sees, hears, or is touched by and thereafter follows that object. Imprinting is especially important for nidifugous birds — species that walk away from the nest shortly after hatching — because they must immediately follow their mother in order to survive. They imprint by sight and the lesson lasts a lifetime. If the first thing they see is their mother or another member of their own species, life is good. If not, they grow up believing they are another species and will never find a mate. Imprinting happens at different times for different species so wildlife centers use surrogacy techniques, described here at the Wildlife Center of Virginia, to insure that baby birds don’t imprint on humans. If they do they cannot be released in the wild. 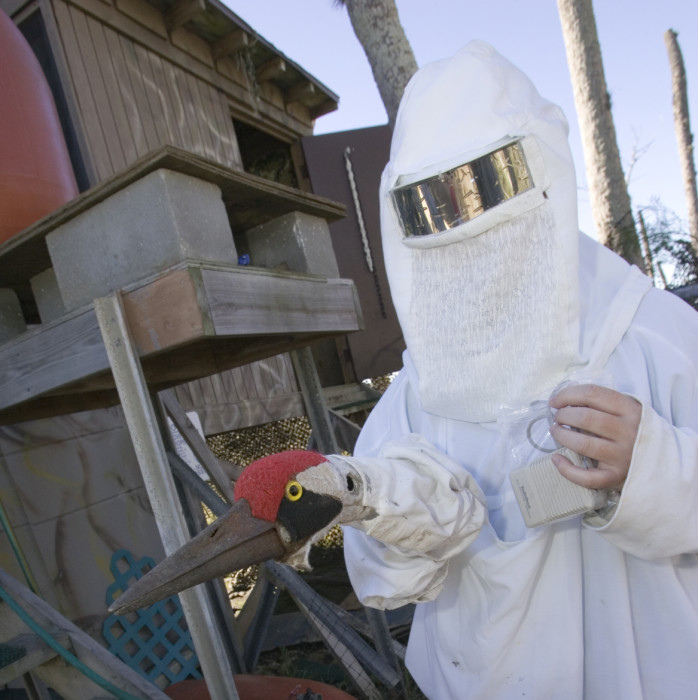 Human imprinting is well known among cranes so caregivers in the Whooping Crane Recovery Program dress in crane costumes when in sight of the young birds. Birds use filial imprinting but there are other forms. Studies have shown that we humans prefer the first computer software we use and then compare all new software to that first and favorite app. It’s a form of imprinting called Baby Duck Syndrome. “I don’t like this; it doesn’t work like Microsoft Word.” Quack! Quack! As for the Canada goose in the video, observers speculated that the bird’s mother laid his egg in sandhill crane nest. When he hatched he saw a sandhill crane and imprinted on the wrong species. He’s the victim of an imprinting error. Nesting season began last month for this pair of Bermuda cahows when the female laid her single egg on 10 January 2019. The parents are now taking turns at incubation duty. They expect the egg to hatch in early March. Watch them in their nest burrow at Cornell Lab’s Bermuda Cahow Cam. And for a preview of things to come, here’s a video of last year’s activity.